Last year, I finally found a copy of John Steinbeck’s writing journals during The Grapes of Wrath. 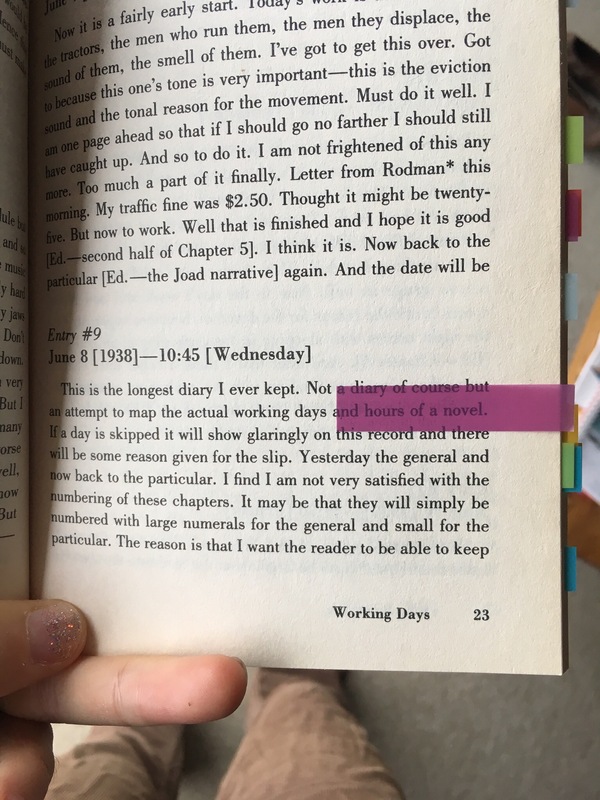 It’s a book called “Working Days.” I was in Davis, California at a used bookstore when I finally found it, just sitting innocuously on the shelves — seemingly unaware I had been searching for a way to buy it for months. Working Days is a complex journal of how the days passed for Steinbeck while he wrote one of the most influential books of his repertoire. Of course, there’s no way he could have known that at the time, but I find it incredibly therapeutic to see what he was thinking of when he sat down to write. Most days, he was thinking of everything but writing. Most days, he was focused mainly on how to get himself to show up. Quite a few of the entries are unfinished, like he lost his train of thought in the middle of the actions of the day. For the next month, while doing National Novel Writing Month (or, NaNoWriMo for short), I’m going to share my Working Days. My daily reflections. Not the writing, just the observer of the work. First, here’s my favourite Steinbeck entry. Then, away we go! What does success look like for NaNoWriMo? I have no daily minimum word count. Well, I guess I do. Let’s say a 10-word daily minimum word count. I’m meeting a lot of new, amazing people, and having a lot of deep discussions. Which feels like fuel for the writing fire. I have 3-4 editorial deadlines coming up, and all of the topics are applicable to my book. Wrote 1393 words for an article for Zendesk about the value of showing up to work as a full human being. What does it look like? What are the symptoms and negative effects of continued segmentation of our lives/interests/passions?